cadvilla is a completely new architecture software based on one of the most modern development tools, that distinguishes itself by its ease of use and extensive performance characteristics. We are convinced that with cadvilla we are providing you with an outstanding product. The latest version of cadvilla is the version 8.0.0.2. This version is available since February 1st 2019. All previously mentioned prices are valid for the latest version of cadvilla. cadvilla runs on all Windows operating systems. You will find other performance characteristics for each version as a comparison here. You will find more features for each version as a comparison here. 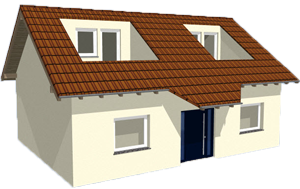 Today the use of modern CAD software in the area of house planning is a matter of course and therefore essential. But what does the word CAD software actually mean? The term CAD software literally means "computer aided design". This means that it is a special program to create building plans and construction plans. The CAD software is particularly popular among architects, house builders and private people who enjoy doing home improvement. They all use CAD software to create and design building plans in a quick and easy way. With the help of the right CAD software, anyone can quickly become the house builder of their own dream living space. 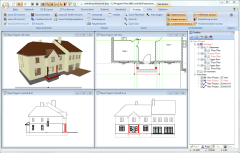 Modern CAD software for architectural purposes is fast and easy to use. 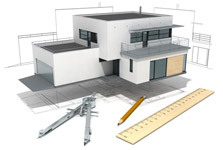 It supports each step in the planning process by means of a project wizard, allows various perspectives such as 3D view or 2D top view, includes many tools such as wall and ceiling types or window and door types, provides different furnishing objects and ensures the opportunity to export planning files for other CAD programs. Professional CAD software also focuses on the demands of its clients and therefore offers for example tutorials in the form of training videos for new CAD users. In addition to all important basic functions, a professional CAD program also includes many other practical functions specific to the industry in order to achieve your goal in just a few steps. The use of professional CAD software does not imply any limitations and can be used at maximum performance. The catalog of requirements for modern CAD software is comprehensive. However, modern and professional CAD software for architecture includes all necessary basic functions and also provides many other functions. home-planner own 3D room planner or easy to use room planner modules for quick planning. The architecture program cadvilla meets all the requirements of professional CAD software and provides information through various guide books and support channels. cadvilla is a modern and professional CAD software with a decent price/performance ratio. Cadvilla supports you in an efficient and fast way of fulfilling your dream of owning your house or home. You will find more articles helping you plan your house in our guide for house builders. cadvilla is delivered and installed in 10 different languages (multilingual). Switching the user interface to another available language is always possible. The software includes manuals in PDF format in English, German and French. The cadvilla installation file is running under Windows and contains a 32 BIT and a 64 BIT software package. By default, cadvilla is installed in the 32 BIT version. 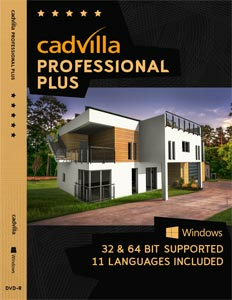 If you have a Windows operating system with 64 BIT, cadvilla is installed in the 64 BIT version. - cadvilla basic: Plane house or home where no sectional views/views are required for the design. - cadvilla basic plus: House or home where also sectional views/views are required for the design. - cadvilla professional plus: Sophisticated house or home/multi-family house - also with a complex roof and special window shapes and a design of the external area with a 3D constructural designs. The design of the outside area is performed via elevation points, elevation lines and topographies. cadvilla includes by default extensive catalogs for objects, textures and materials. - over 1,000 high level materials. 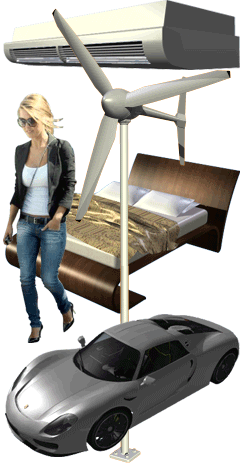 The project can be displayed in the 3D view in a photo-realistic way. When inserting a background image (e.g. a photo of the property), you see immediately how your house will look on your property. In case of a simulation of the course of the sun and the shade, the start and end time of the simulation is defined in a dialog as well as the geographical location of the construction project. The simulation of the course of the sun and the shade is available in all packages of our 3D home planner software cadvilla. Virtual tour through the project in 3D. The virtual tour through and around the building gives you a first impression of your house. You can control the viewing direction by using the mouse (head) - you can control the movements inside the house (legs) by using the cursor keys. The function of a virtual walking tour through and around the building is included in all packages of our house planning software cadvilla. Sectional views and side views (for example North, East, South, West view) are on one hand required for the building application, while on the other hand also for the design (for example inserting a wall under a staircase). You will require a sectional view for the wall marked red in the adjacent image so that you can adjust this wall exactly to the course of the stairs in the sectional view. - Obtaining and modifying the ridge height. In order to be able to measure the overall height from the bottom to the gable with the measuring function and to be able modify it, you require a side view like the image on the right. For modification purposes you can then select the roof directly in the side view, and you can move it by the desired value. - Windows over multiple floors. When a window spreads over multiple floors they require wall recesses which can only be defined exactly by using the mouse in a side view of the wall. The creation of a sectional and a side view is an important function when you are planning a house. 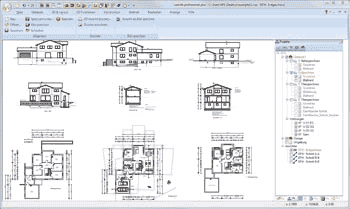 How to draw a floorplan with cadvilla can be found here. You require that vector graphics are generated from top views, side views and sectional views so that you can once more make the final edit for the corresponding view for the plan printout. In the view on the right we created with our floor plan software cadvilla a vector graphics (right view) from a side view (left view) and edited it. You can see that the floor division line was removed and that modifications were made regarding the display of the door and the balcony. You can of course also print the automatically generated views but in some cases such a function is required. 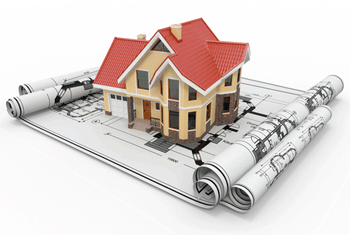 To create a home plan, the subsequently editing of a vector graphics is a useful addition. The cadvilla Tutorial includes extensive training videos so that you learn quickly how to use cadvilla. With this video collection an entire floor plan design is shown from the beginning to the end by means of a sample floor plan design. The video collection is directly installed to your computer and does not require internet connection while watching it. In cadvilla basic and cadvilla basic plus this video collection can only be watched online (big data volume and permanent internet connection necessary). Also take a look to our cadvilla support area. For exactly visualizing your dream house with a professional 3D house planning software you may still need a special roofing of your terrace, a modern carport or the exact display of the downpipes? There is a 3D module in cadvilla that generates 3d constructural designs for this area. The 3D module facilitates - in addition to the constructive possibilities - also an extension of the 3D catalog by own objects. Due to the combination of 3D solids - consisting base solids, extrusion solids, rotational solids and solids that follow a contour (e.g. 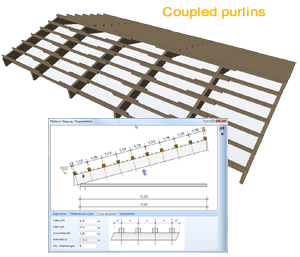 - rain gutters or bottom battens) - new objects can be generated due to blending features (Boolsche operations) in order to use them in your project. In this example you find several objects that were created with the 3D module. Typical application examples for the use of 3D constructural designs in order to create objects are e.g. 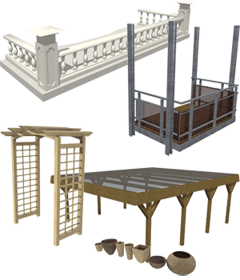 carports, terrace roofs, balconies, trusses, rose arches, flower pots etc. 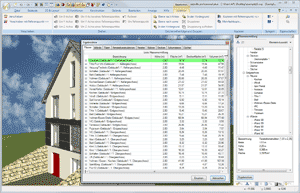 This element of the software allows you to generate your own window versions for further use in the design process. This relates in particular to all special forms of windows that are not included in the standard scope of cadvilla. Additionally, existing version of windows can be loaded, added and modified. 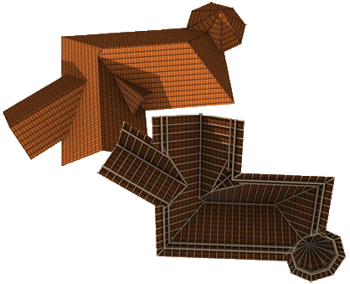 Here you can find more details about this module "window construction"
With this supplement you can generate polygonal and rectangle roof openings and elongated roofs. Roof openings are for example required for defining roof terraces - elongated roofs are roof eaves, e.g. in the entrance area. You can give an elongated roof also an individual contour (see image) using the function roof openings. You can cut entire roof areas skewly and thus you can have any kind or roof edge. The starting base for merging roofs are individual roofs in the knows basic roof forms that are already positioned accordingly to each other. Then the roofs are merged with 2 mouse clicks and the timber constructions that are geared into each other can be corrected. The recalculation of the complex timber construction as well as the entire roof shape is performed completely automatically. The previous individual roofs can of course still be processed and moved, flipped, edited or also be pulled out of the entire roof landscape anytime. Merging the roofs allows the user to plan and display nearly every roof shape in the details and to create special forms of roofs that are not possible to create with the normal roof and dormer function. In addition to many other points a roof design accurate in every detail makes sense for e.g. the exact positioning of solar elements. Regarding an extended timber construction for roofs you can add, move or delete individual rafters and purlins manually. Beams can be added via 2 arbitrary points or via 2 points on one level. When manually inserting rafters, the roof side is inquired first (in order to adopt the angle and the length) and the positioning afterwards. All woods that were automatically generated and put in ex post, can automatically be trimmed on one or two levels. The planes of reference are thereby inquired manually. With the area- and mass determination all elements included in the planning (rooms, walls, windows, doors, pillars, ceilings, chimneys, roofs) are listed in clear tree structure. When selecting individual elements from the tree structure the properties such as dimensions, areas, volumes, formulas etc. are displayed in the detail window, and in the floor plan the element is marked red accordingly. This way you have with our floor plan software - in addition to the detailed presentation of masses - also a visual control in the 3D view. An entire presentation of masses as part of the project can be created in form of a table/list in different formats (Excel, PDF, RTF). This way you can create for example a list of all walls including all masses and areas for further calculation and proposal presentation via generating an EXCEL file. The mass determination offers the possibility of a room data sheet for the calculation of the residential floor area according to the living space ordinance (WoFIV) and the determination of the volume capacities according to the standard DIN277. - PDF (Portable Document Format) - is the standard format for documents and can be displayed with free of charge programs such as Acrobat Reader. The bigger packages of our 3D CAD House planner Software cadvilla includes the plugin "Play Layout". The plan layout serves as a scaled alignment, design and printout of plans and drawings. It operates directly based on the current project data and construction details without being separated from the building model. All modifications on the constructural design are automatically updated in the plan layout because everything is based on the project model. Thus, deviations between the project and the plan can be excluded. Typical use for a 3D export: design with the 3D room planner (included in all versions cadvilla module) quickly a room design in 3D, and then export this scene into another 3D program to make further details there. After loading the file you will receive a preview dialog. There you can select the contents to be imported in the layer windows by activating and deactivating the layer. After or during the import you can adjust the scaling and the display of the lines. The DXF/DWG file is first imported as one element, a 2D symbol. The DXF/DWG import can for example be used for the adoption of architectural drawings or for the import of 2D symbol catalogs. When taking over symbols you can take apart the symbol into individual elements during the design, if needed, edit it and then save it with the standard functions in the 2D catalog. When taking over floor plans you can use the imported layers after they have been loaded in cadvilla like auxiliary lines in order to capture for example walls on them. Additional CD with objects for ArCon (file ending*.aco) can be coverted without any problems in the object catalog of cadvilla. Typical use for 3D Import: You get, for example, from your kitchen designer a 3D kitchen planning that has been designed with an external 3D Kitchen Planner software and you want to import the 3D kitchen into cadvilla. PS. Of course, with cadvilla a 3D kitchen planning is also possible. This function allows you to load in existing projects (*.acp) which are based on ArCon[planTEK] or ArCon open and then further edit them in cadvilla. Furthermore ArCon projects can be taken over up to version 6.30. Ideally, the complete project with all walls, ceilings, windows, doors are taken over in 3D and can then be edited, modified and added further with cadvilla. Please note our notes on older versions of ArCon in connection with a possible upgrade to cadvilla. In case of 2D DXF/DWG export you can determine which layers should be exported - in our example this is the 2D view and the floor plan - first floor. This happens by activating and deactivating the layer in the layer window. Furthermore you can determine on your own which software version of AutoCAD should be considered for the export. This ranges from AutoCAD R09 up to AutoCAD 2013. From AutoCAD R12 on DXF and DWG export is supported. The area options allows you to export the RGB color values, to determine the hatching scale and define the line type factor.